In the heart of white truffle season, here is your guide to navigate one of the most highly regarded (and widely counterfeited) ingredients on the market. Truffle hunting is the California gold rush of the culinary world. To get their hands on the coveted fungi, truffle-hunters head out at dawn with hopes of uncovering the buried treasure—and making sure they don’t get highjacked by any tuber bandits in the process. Available between October and December, Alba white truffles—the most rare and flavorful type, thanks to the alkaline-rich soil of the region of Italy that they’re named after—have sold for more than $300,000 each, leading opportunistic conmen to sell over-priced lookalikes. The black truffle, which has a considerably longer harvest, usually comes from France and Spain, but similar-looking varieties from China (which have far less flavor) are often used to dupe unsuspecting buyers. Truffles are a hybrid of a fungus and a tuber, and they grow symbiotically with trees, filling in the space alongside the roots of their host (hence their funny shape). They release a pungent aroma that mimics pheromones, which allows pigs and dogs to sniff them out in the wild. Though truffles are traditionally served raw, shaved over eggs, pasta, and risotto, chefs have begun deploying them on everything from burgers to pizza. While some of these high-low dishes are legitimate (see: the coveted white-truffle burger available now at Soho’s Burger & Barrel), the majority are enhanced not with actual truffles but rather truffle oil, which has little to do with truffles at all (we’ll get there). Given all the high prices and duplicity in the truffle business, it pays to know what you’re eating. Here, we chat up an expert to get the hard facts. The expert: Sandra Lotti, owner of Toscana Saporita, an Italian cooking school for Americans near Pisa. 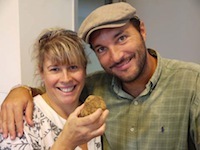 For students enrolled in late fall, the school’s two-week sessions include a truffle hunt in the cool and damp wooded areas of Tuscany led by Lotti, as well as truffle hunters Luciano and Cristiano Savini (plus their dog, Giotto), who uncovered the record-breaking 3.3-pound white truffle in 2007 that sold for $330,000. Truffles aren’t just black and white—but those are the most expensive and desirable varieties. Truffles come in all colors, shapes, and tastes. In the U.S., for instance, Oregon yields a few species (white, black, and brown), while the Italian bianchetto is a light to reddish-brown color. Italian white truffles (tuber magnatum pico) and Périgord black truffles (tuber melanosporum), which are grown in France, are the most highly regarded (and expensive) in the culinary world. Lotti says: Périgord black truffles have thick, irregular, and dark skin that resembles that of a blackberry, and the inside ranges from light to dark brown, depending on the type of tree it grew off of. The scent is very intense with hints of garlic, methane, gas, dirt, and aged cheese. Alba white truffles have smoother skin and range from white to light hazelnut in color, and the pulp is very pale with purple or iridescent veins. The white truffle’s fragrance is addictive. It is slightly more intense than the black with a potent scent of garlic, dirt, and cheese (like Camembert). In simple words—amazing! What makes them expensive is their lack of abundance. White-truffle season is just barely three months long, and prices range from $6,800 to $8,100 per kilo (2.2 pounds). Black truffles—which are farmed from May to October—typically go for between $680 and $810 per kilo. Not all white and black truffles are of the Alba or Périgord quality, so don't get tricked into overpaying for lesser varieties. Lotti says: Aestivum, excavatum, rufum, melanosporum, and puberulum are some of the different types of truffles. Each one differs in taste and scent, determined by the trees whose roots they grow around. For example, Italian white truffles grown in Alba come from hazel, birch, poplar, willow, chestnut, and pine trees, to name a few, which contribute to their unique and powerful taste. Additional notes: The black summer truffle (tuber aestivum) is woody and does not have as strong of a taste or aroma as the Périgord black. The tuber brumale, also black, is not very palatable (it has a bitter and musky taste). Chinese truffles (tuber sinensis, tuber indicum, tuber himalayensis) also closely resemble the Périgord, but they have only a fraction of the flavor. Be careful with the Italian bianchetto (tuber borchii), which has a nice taste but is often substituted—both deliberately and accidentally—for the white Alba, as they resemble one another in aroma and appearance while they are young. Truffles must be handled properly and consumed immediately, or they will lose taste. Lotti says: They should be served fresh and within one week of when you dig it out from the dirt. After about four days, they can begin to lose flavor. A fresh truffle needs to be wrapped in paper towels, which need to be changed daily. It oozes out a lot of moisture; the paper towel will preserve it. It then needs to be stored in a jar, sealed, and kept in the refrigerator. Heat destroys the aromatics and taste. Truffle oil doesn’t contain truffles and should not be more expensive than olive oil. Made from olive oil and an organic compound called 2,4-Dithiapentane, truffle oil does not actually contain any real truffles. Lotti says: I hate it and real chefs do not use it. It contains a flavor enhancer, not truffle. Anything can be created synthetically, which is why you need to buy certified products. The Savini family—who leads us on our truffle hunts—has been in the business for almost 75 years. They are the best producer in Tuscany, and one of the best in Italy. Truffles release a chemical that smells very similar to the pheromones released by a male pig. This attracts pigs and dogs to the truffles, which is why they are taken on truffle hunts. Lotti says: The truffle hunt happens very early in the morning—between 5 and 7am—with one dog only. We use a breed called Lagotto, which are mutts, as they are easier to train. We also have a digger and a flashlight. We go early in the morning because we do not want to be followed (truffles are like diamonds! ), and also because the dogs can smell them better. Later in the day, the flowers and herbs will give off scents that can confuse the dog’s sense of smell. Page Truffle oil doesn’t contain truffles and should not be more expensive than olive oil.